Hmmm trademark burger. In a delicious victory, Bubba Burger is about to be granted a unique trademark registration that covers the shape of its burgers…unless someone opposes this meaty decision by the Trademark Office. Before everyone gets all worked up, shapes are generally not protected as a trademark. In order to be protected as a trademark, something must be unique and its purpose non-functional. For example, one cannot register a trademark for a box and sue everyone who packs up there things and decides to move. The shape of the box is its function. A recent example of a non-functional shape trademark was Dan Akyrod’s Skull Vodka bottle. The shape of the bottle as a skull serves no function other than being decorative, therefore it was granted trademark protection. In February 2018, Bubba Foods, LLC filed a trademark registration application for the look of its burger in a class described as “Hamburger patties ; Kabobs (meat) ; Ribs (meat)”. The actual trademark can be seen to the right. 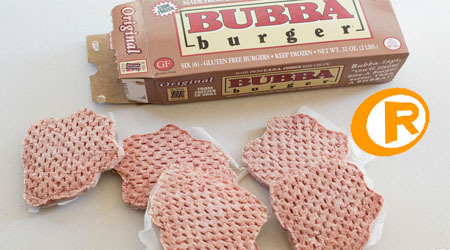 Why is Bubba Burger shaped that way, for no particular reason. Since it has zero function, it can be protected as a trademark. After almost a year of back and forth with the Trademark Office the mark was approved for publication. Therefore the mark is in the home stretch of being granted but anyone with a legitmate legal interest in not seeing the mark granted has a couple more weeks to oppose the registration of the mark. While this is highly unlikely, if you happened to make similar looking burgers before Bubba, your time to act is now. On a side note, I am vegan and I put my beliefs aside to bring you this very important trademark news. I am going to hit the shower because I feel so dirty.